We’ve been eating a lot of roasted baby potatoes in our house since I discovered the reasonably sized bag at Costco. I think it’s 5 pounds, very manageable and likely to be eaten before growing the dreaded sprouts. They couldn’t be easier to fix and they have the perfect ratio of seasoned crispy skin to creamy inside that’s a bit sweeter than the average potato. Also, they go with everything, are far more nutritious than fries or tots, and are ready in about 30 minutes. What’s not to love? This recipe is super basic but I’ve added some suggestions for you to jazz it up with different spices and some fresh herbs. Like many kids, my girls like me to keep it fairly simple but if I’m serving guests I like to make them a little more interesting. Preheat oven to 425 F, using the convection setting if you have it, if not, preheat to 450 F.
Give the potatoes a good rinse and a quick scrub then dry them thoroughly. Place them in a single layer on a rimmed, oven-safe baking pan. Drizzle with olive oil, then sprinkle with salt, garlic powder, and other dried herbs/spices you choose. Use your fingers to coat each potato with oil and seasonings. Bake in preheated oven for 20 – 25 minutes, until soft inside and easily pierced with a fork. 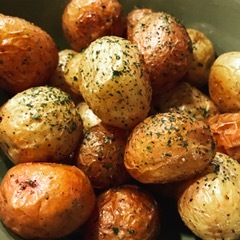 Transfer potatoes to a serving bowl and toss with a little more olive oil, fresh herbs (optional), and freshly ground pepper. A lovely quote for all my girls. As life continues to get more complicated and confusing, we have to remember to keep finding the joy!